Having graduated with a BA/Hons in Journalism from Liverpool John Moores University, Alex began his career as a sports journalist, first at the Liverpool Echo and then at the Press Association. Alex then successfully auditioned for Channel 4 after seeing their advert for the Half Million Quid Talent Search to find new disabled talent for the 2012 Paralympics. He joined Channel 4 fully in March 2012 and reported at the Paralympics Opening Ceremony, interviewing Boris Johnson and the Prime Minister in front of a TV audience of 11 million people. He now co-presents the award winning show The Last Leg on Channel 4, which has recently wrapped on its 13th series. The show continues to go from strength to strength, and Alex and his co-presenters Adam Hills and Josh Widdecombe are fresh off sweeping up gongs for Best Entertainment Performance two years in a row at the 2018 & 2017 RTS Awards, having also perviously won Best Entertainment Show at the 2017 RTS awards. Last year Alex wrote and starred in his first Sky Comedy short ‘Hands of God’. The comedic story centred around Alex who played a man due to have a pioneering double hand transplant. The sketch was very well received and showcased Alex’s talent for acting. Back in 2011, Alex first featured on screen on Channel 4 as a reporter on That Paralympic Show. He went on to report on athletics at the 2011 BT Paralympic World Cup, and later on football at the 2012 BT Paralympic World Cup. Alex acted as chief writer on the official guide to the 2012 Paralympics, which included comprehensive venue and sports guides, facts and figures, features on key athletes to look out for in London and a glimpse back at the most memorable moments from past games. 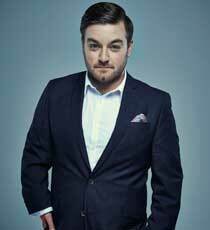 In 2013, Alex fronted his own documentary for Channel 4, Alex Brooker: My Perfect Body, in which he explored questions surrounding male body image whilst attempting to lose two stone in two months. Alex pushed his body to the limit, trying out a variety of extreme fad diets like the cayenne pepper diet, on which he lost 10lbs in only 7 days. In 2014, Alex co-hosted The Jump alongside Davina McCall, as twelve celebrities competed at an array of the most challenging and extreme of winter sports in order to be crowned champion. Due to his sharp wit and humour, Alex has also become a panel show favourite, appearing on 8 Out of 10 Cats, Fake Reaction and Never Mind The Buzzcocks. In the run up to the 2016 Paralympics, Alex also hosted popular magazine Saturday daytime series The Superhumans Show, featuring all the latest news from qualifying events for the games.